Since 1938, Daytona Beach Housing Authority (DBHA), a Public Housing Agency, has offered subsidized, income-based housing and homeownership opportunities for qualified low-income families, the elderly, and persons with disabilities in Daytona Beach FL. 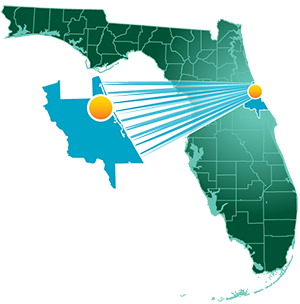 Daytona Beach Housing Authority manages several housing programs including Public Housing, HCV (Housing Choice Vouchers, previously Section 8 Housing Choice Vouchers), both funded by the federal Department of Housing and Urban Development (HUD). Other housing programs offered include VASH (for veterans) in conjunction with the VA, Workforce Housing, Low Income Housing Tax Credits (LIHTC) housing and RAD (Rental Assistance Demonstration) program, Neighborhood Networks, community partners, a resident council and resident advisory board. Working with our Community Partners, Resident Council & Resident Advisory Board, we offer supportive services programs to educate & enhance the life of our Residents. Our goal is to assist each Resident to work toward sustainability. For example, the DBHA Family Self-Sufficiency Program (FSS) encourages low-income families to learn savings skills & allows a portion of their monthly rent to be placed in an escrow account that builds for Home Ownership. The ROSS program offers a program coordinator who links Residents with training opportunities, job placement organizations & local employers. We offer quality housing in our clean, safe and sanitary communities: Maley Apartments, Windsor Apartments, Palmetto Park, The Villages at Halifax, The Villages at Halifax II, Northwood Village, Northwood Village II. Regular REAC inspections of our community properties ensure each property continues to meet our standards. The Daytona Beach Housing Authority communities are conveniently located near educational and entertainment opportunities including: Bethune Cookman University, Daytona State College, Embry-Riddle University and Daytona International Speedway. Please contact Daytona Beach Housing Authority (DBHA) for more information and program availability.